You may have heard about the re-launch of La Palina, “a storied cigar brand famously linked to the early and fortuitous beginnings of CBS Broadcasting.” In recent weeks its revival has been covered by the likes of Cigar Aficionado, the Wall Street Journal, and others (including an ad on this web magazine). La Palina is being brought back to life by Bill Paley, grandson of the founder of the Congress Cigar Company. The outfit dates back to 1896. 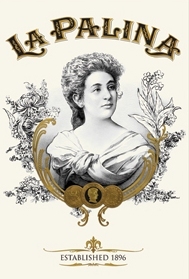 La Palina was its flagship brand, marketed over radio waves—hence the connection to CBS. I am told that W. Curtis Draper in Washington and Davidoff of Geneva in New York are the first two La Palina retailers. The brand is expected to be available nationwide soon. StogieGuys.com is pleased to announce that we have secured two pairs of tickets to the exclusive La Palina re-launch on Thursday. The event, held at Morton’s in Washington, DC, will feature cocktails, canapés, and La Palina cigars. It will run from 6:30-8:30pm. To be entered for your chance to win a pair of tickets, simply leave a comment on this article that reads: “Get me to La Palina.” All eligible comments received before midnight will be entered into a random drawing. Two winners will be selected, each receiving two tickets. As a courtesy to your fellow StogieGuys.com readers, please enter only once and only if you can make the event. You’re all on the honor system. Also, please be sure to include a valid email address so we can contact you if you win. Good luck! $20 for a stubby little robusto mutt? Come on. I know it's an inaugural edition and all, and maybe I'm just not the target consumer, but this reminds me of the Virginia wine market – overpriced and underaged. Get me to La Palina! Dave, I smoked a pre-release version back in September or so, and it was fantastic. Was it a $19 cigar? Almost. I'd pay in the $12-15 range for it. Get me to La Palina!! Get me to La Palina… hope to see you guys there. Get me to La Palina…can't wait for the event! Get me to La Palina can't wait! Get met to La Palina! That may be the only way I'll get to smoke them at $19 a stick. Curious to see how well this old brand can be resurrected though. “Get me to La Palina.”. Word for word, and if I don't win hope whoever does enjoys the smokes! Can't wait to visit Draper's and check these out. I would bring my wife to this as well…except she's pregnant with our first child. So, there hasn't been a lot of smoking around the house as of late!! Hope to see you fella there. Get me to La Palina, please. Looking forward to meeting the winners and giving them some extra stogies. Visit our site lapalinacigars.com for more info. Keep reading Stogie Guys. Get me to La Palina. Hell yes, get me to La Palina! The winners Charlie and David have been selected at random using http://www.random.org and they've been contacted.